The national debt clock, as it is known, is a big clock. A spot-check last week showed a readout of $8.3 trillion – or more precisely $8,310,200,545,702 – and counting. But it is not big enough. Sometime in the next two years, the total amount of US government borrowing is going to break through the $10-trillion mark and, lacking space for the extra digit that such a figure would require, the clock is in danger of running itself into obsolescence. The clock’s owner, real estate developer Douglas Durst, knew such a problem could arise but had not counted on it so soon. “When it became clear what was going to happen, our first thought was to free up the digital square occupied by the dollar sign so that we could cope with a 14th digit,” Durst said. The latest plan is for yet another replacement, involving a larger scale signboard. “We’re not happy at the impact we’re making with this one,” he said. Durst insists that the clock is non-partisan in its effort to shame the federal government over what he sees as its willingness to gamble away the nation’s future. “We’re a family business,” Durst said. “We think generationally, and we don’t want to see the next generation crippled by this burden,” he said. Last week the “family share” readout on the clock stood some loose change short of $90,000. I’ve got a better idea. Instead of upgrading the clock, let’s pass legislation forcing the federal government to cease operations whenever they’ve bumped our future (and the future of our children) over 13 digits long. It’s also interesting to note that Sploid had to go to a Libertarian website to get a live debt clock link. I guess that’s because the Republicans and Democrats are more concerned with spending your money than in finding some immediate and meaningful solutions to our runaway debt. “The final coup in the Revolution of 1913 was the passage of the Federal Reserve Act which help create the private banking cartel that now issues the nation’s currency and establishes the going rate banks must pay for cash.” Same url as above. Curious about his clock, I googled it. Most of the stories were upbeat ones from around 2000 rejoicing in the clock being turned off. Anyway, thought it was interesting that the debt clocks vary a bit. It appears that both debt clocks are a tad off. Fiddling with creating a version of Louisiana’s that retrieves the figures from the government website and tries to calculate a figure. It appears that over time, the graph is fairly linear, so no fancy curve fitting needed to calculate a rate of change, for now? Here’s my minor adaptation of the Louisiana one. Dunno, I get a rate of increase that is half theirs. does in fact push the rate to close to the 20k per second mark. Sad. On Sunday, my local paper ran a book review about a book hailing William Jennings Bryan as a hero, partly for condemning the gold standard. Oh how great he was for that! Just wonderful, wonderful. It shocks the hell out of me that the most important problem that we face isn’t being talked about and on the rare occasion that it is, the viewpoint that is promoted is the one in support of the problem! Americans deserve to be utterly and permanently crushed and hobbled by this debt. When the dollar is destroyed, every last shred of liberty and sovereignty that Americans presently enjoy will have to sacrificed in order to maintain and continue the expansion of the government. Even if we end really force the debt cap to US$0, they’ll just find ways to redefine debts as something else. 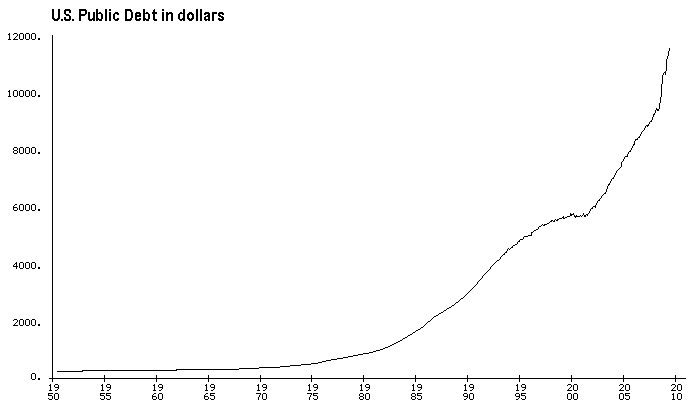 If we found a way to stop the Feds from spending more than they take in, the’ll just have Bernanke print some more. It is an endless battle that shouldn’t focus on stopping spending but stopping the power expansion — end the power and you end the spending. Looks like the slower rate of increase based on longer term is more accurate, at least right now. We wouldn’t even think of looking for a debt clock from a Democrat or Republican source. It would be a complete waste of time. I like your idea about shutting down the federal gov’t when the debt reaches 13 digits. It’s a lucky number! But seven is a lucky number too, so why not shut ’em down at seven digits?